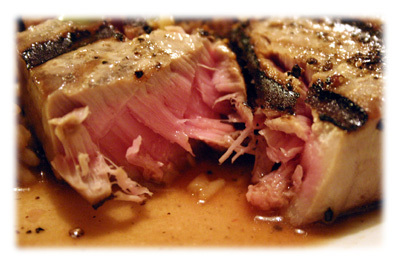 Fresh Tuna steaks aren't cheap but they're worth every penny when you grill them using this recipe. Follow the short-time, high-heat method below and you'll be blessed with perfect Sushi grade grilled tuna steaks every time. The beauties in this picture above are shown moments before going on the grill - a quick rub with a little sesame oil and some freshly crushed black peppercorns and on they go. Seared on the outside and perfect sushi grade inside, these tuna steaks match perfectly with the Asian Hotpocket grilled vegetable side dish. Clean and oil the grates of your BBQ. Preheat the grill to 700F if possible (or as hot as you can get it). 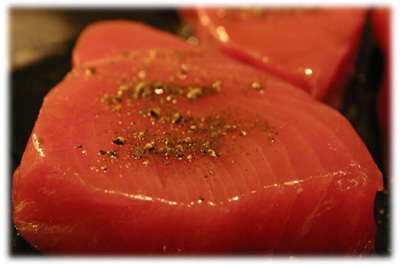 Drizzle sesame oil over both sides of the tuna steaks and lightly rub over the flesh. Sprinkle crushed black peppercorns over both sides of the tuna. 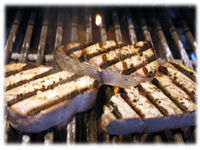 When the grill is at temperature, lift the lid and place the steaks on the grill at 30 degree angle to the grates. Close the lid and with a watch time the cooking for 1 minute and 10 seconds. After 1 minute and 10 seconds lift the lid and carefully work your spatula under the tuna steaks and carefully flip them over. Close the lid and cook for 1 minute only this time. These times are specific for grills that can attain 700F. If your cooking less than that you'll need to add a few seconds on to the time. 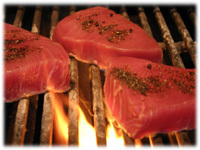 After the minute is up, lift the lid and remove the tuna steak from the grill. If done properly you should only see seared penetration approximately 1/4" to 3/16" - the rest of the flesh should be perfect sushi grade.